Unfortunately this present was connected with the request to get it running with my Intel Edison and the Smart Gateway. This blog will be part one of my endeavor. My Intel Edison still runs the old firmware, so the first thing I would like to do is to bring it to the newest software/firmware level. which is part of the firmware package from Intel. Please follow the instructions from the flash utility! With the new firmware up and ready, we will have to login to our Edison and reconfigure. If you are unsure how to connect to the console of your Edison, please ask your friend Google about it. I am always a fan of using the newest version of whatever I work with. With the Firmware and software packages on the Edison now being all “up-to-date”, let’s start by activitating bluetooth and connecting to our TI Sensortag. Login to your Edison and perform the following steps to activate bluetooth. In the scan you can see that our SensorTag has been identified and you can and should note down the MAC-Address. For this we will use some code created by another colleague of mine. Well, seems to work we can continue. For the installation of Node-Red, please take a look at my earlier blog. Please note, that up to this stage of my writing, I have not automated the activation of Bluetooth on the Edison, so after every power-up, you will have to perform the following steps. Hopefully at some point in time, I will find the time to solve that as well! After the reboot, we can login to Node-Red via the Browser-UI of Node-Red. Use the IP-Address of your Edison and Port 1880. In the “Advanced” section of the Node-Red nodes, you will find our newly installed “SensorTag” Node. Drag in onto the canvas and double-click it to change it’s properties. Depending on what data you want to read, select the corresponding checkbox. Now add the “Debug” Node and connect the two Nodes. 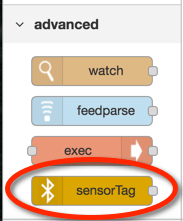 After deploying the flow, there should be a comment right below the “sensorTag” Node showing it’s status. It should start with “discovering” and result in “connected”. 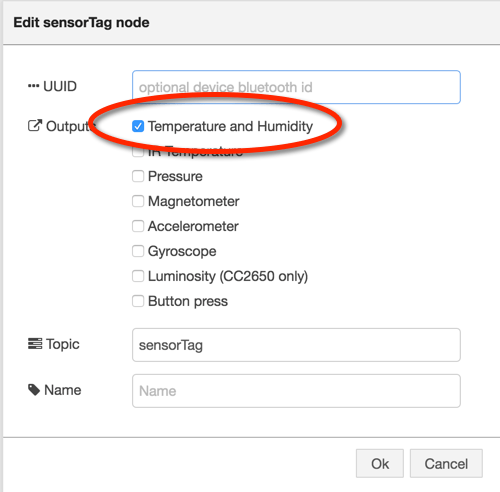 If it does not, that you probably forgot to activate your SensorTag or the Bluetooth functionality on the Edison. 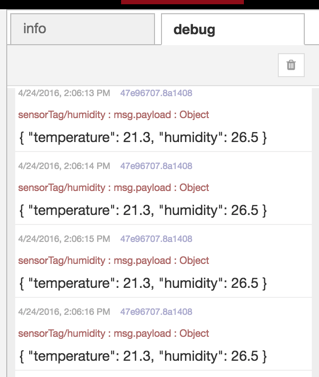 After a short while, the data coming from the SensorTag should be logged in the Debug panel of Node-Red. As you can see, the Node reports the selected data in JSON format, so later processing should not be an issue. For how to integrate this data into my Smart Gateway, please stay tuned! In the step “Reading the data via node js”. I’m getting a fatal error. can you copy+paste the error?